Rekha (not her real name), who lives in the Rangpur Division of Bangladesh, got married when she was just 13 years old – “just after my first menstruation”, as she recalls. A year later the 14-year-old had a child of her own, joining the ranks of the thousands upon thousands of adolescent mothers in a country where child marriage remains widespread, even though the legal age of marriage is 18 for females and 21 for males. Rekha’s story is far from unusual. 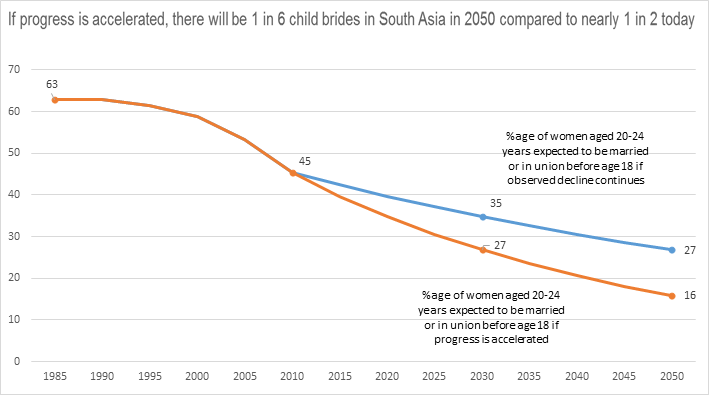 Almost one in two girls in South Asia will marry before turning 18, and one in six will marry before the age of 15, if current rates continue. While the practice of child marriage has declined in South Asia – in countries including Bangladesh, India and Nepal – it nevertheless remains far too high. Child marriage is a practice that primarily affects girls, but boys too. While a much smaller number of boys are married as children, there are also child grooms in the region, who marry even younger child brides. This map shows the countries where marriage under the age of 18 is prevalent. For literally millions of girls like Rekha, child marriage violates their human rights. It threatens their lives and health, as well as their future prospects, exposing them to early pregnancy, and increasing their vulnerability to exploitation and abuse. Child marriage, quite simply, robs them of their future. As the evidence shows, girls who marry young often become pregnant while they are still adolescents, putting them at risk of complications in pregnancy or childbirth – complications that are a leading cause of death among older adolescents in developing countries. They are also more likely to experience violence, including sexual violence, than girls who marry over the age of 18, and to be more exposed to sexually transmitted diseases and HIV. When they marry, girls are often forced to drop out of school so they can assume household responsibilities, losing the right to complete their education. Child marriage limits their opportunities, including their job prospects, and has long-term effects on their families. It also has negative impacts on their children. A recent global study in five middle-income countries shows that children born to mothers 19 years or younger have a 20-30% increased risk of low birth weight and pre-term birth, compared with children born to mothers aged 20-24 years. Moreover, they have a 30-40% increased risk of stunting and failing to complete secondary schooling. This leads us to the question of the economic implications of child marriage. Where such estimates are available, the figures are staggering. For example, in Nepal, under a set of conservative assumptions, the cost of child marriage considered solely from the labour-market perspective is estimated at almost 75,000 million Nepalese rupees (about US$700 million). This represented 3.87% of the country's GDP in 2014. A World Bank and Red Cross study on the global costs of child marriage is currently underway, with findings due to be released next year. While many countries in South Asia have laws in place to prevent child marriage, the practice persists. Often, at the state and community level, traditional and customary laws still allow girls younger than 18 to marry with the consent of parents and other authorities. Unequal power relations between men and women, women’s and girls’ restricted rights and opportunities, and norms which place a higher value on sons than daughters, all reinforce the practice. And, not surprisingly, vulnerability to child marriage increases during crises when family and social structures are disrupted – for example when families are separated during natural disasters or conflicts, or when they are faced with economic hardships that prompt parents to marry off their underage daughters. Countries around the world have committed to Eliminate all harmful practices such as child, early and forced marriage, and female genital mutilation in the Sustainable Development Goals (SDGs) that underpin the 2030 Agenda, whose central pledge is to leave no one behind. UNFPA and UNICEF are working together to end child marriage through a multi-country initiative to prevent children from marrying too young, and support those already married. In partnership with governments in South Asia, we are implementing proven strategies for change: keeping children – especially girls – in school, increasing their access to healthcare, educating their parents and communities, increasing economic support to families, and putting in place and enforcing legislation. Strong partnerships at all levels are required to end child marriage. The scale of the problem requires all of us – governments, local actors, the global community and the United Nations – to act together. All of us need to join hands to give back to children, particularly girls like Rekha, their choices, their dreams, their futures and their childhoods.